New Brunswick (French: Nouveau-Brunswick) is one of Canada's Maritime Provinces, and the only officially bilingual province (French and English). Its capital is Fredericton. The provincial Department of Finance estimates that the province's population in 2005 is 758 000 (New Brunswickers). New Brunswick is bounded on the north by Quebec's Gaspé Peninsula and Chaleur Bay and on the east by the Gulf of Saint Lawrence and Northumberland Strait. To the south, the narrow Isthmus of Chignecto connects it to peninsular Nova Scotia, most of which is separated from the mainland by the Bay of Fundy; on its west, the province borders the American state of Maine. The boundary with the U.S. was settled during the Aroostook War largely through the efforts of businessman and political activist John Baker. The total land and water area of the province is approximately 70,000 square kilometres. About 80% of the province is forested, with the other 20% consisting of agricultural land and urban areas. New Brunswick lies entirely within the Appalachian Mountain range, a chain of ancient, eroded mountains which have created river valleys and low, gently rolling hills throughout large parts of the province. The eastern and central part of the province consists of the New Brunswick Lowland, whereas the Caledonia Highlands and St. Croix Highlands extend along the Bay of Fundy coast, reaching elevations of 300 metres. The northwestern part of the province is comprised of the remote and more rugged Miramichi Highlands, Chaleur Uplands, and the Notre Dame Mountains with a maximum elevation at Mount Carleton of 820 metres. Saint John is a port city, with heavy industry in the form of pulp and paper, oil refineries, and drydocks, all owned by the family of the late K.C. Irving. The Irving family also controls much of the province's economy and 3 out of 4 of its daily English language newspapers. Saint John is conventionally written out in full, to distinguish it from St. John's (Harbour), the capital of Newfoundland and Labrador, with which it is commonly confused by those outside of the Atlantic Provinces. Moncton is the second largest city in New Brunswick and also the fastest growing. It is principally a transportation, distribution, commercial and retail center. Moncton has a sizeable francophone Acadian minority (35%) and is considered by the Acadians to be their unofficial "capital". The majority of Moncton's recent growth is traced to economic policies which has led to depopulation in the northeastern area of the province. Fredericton, in addition to being the capital of the province, is a genteel university town, and home to the Lord Beaverbrook Art Gallery, Theatre New Brunswick, the New Brunswick Sports Hall of Fame, and other amenities, including Christ Church Cathedral, whose foundation is the oldest in Canada or the United States. Fredericton is nicknamed the "City of Stately Elms". It has boasted of the largest stand of elms outside of Central Park since Dutch Elm Disease devastated this species in the early twentieth century. The economy of New Brunswick is a modern service economy dominated by financial services, insurance and other services, but is best known for forestry, mining, mixed farming and fishing. The most valuable crop is potatoes, while the most valuable fish catches are lobster and scallops. The largest employers are the Irving group of companies, several large multinational forest companies, the Government of New Brunswick, and the McCain group of companies. The aboriginal nations of New Brunswick include the Mi'kmaq (Micmac), Maliseet and Passamaquoddy. The population is majority English-speaking but with a substantial (35%) French-speaking minority Acadians from Acadia, from the former name of this region during the French colonial period during which large numbers of colonists migrated from the Vienne area of France. New Brunswick is the only officially bilingual province in the country. Until the 16th century, New Brunswick was exclusively the domain of what are now termed the First Nations. The first known European exploration of present-day New Brunswick was by French explorer Jacques Cartier in 1534, who discovered and named the Baie des Chaleurs in northern New Brunswick for its warm waters. The next French contact was in 1604, when Sieur des Monts sailed into Passamaquoddy Bay and set up a camp for the winter on an island at the mouth of the St. Croix River. 36 out of the 87 members of the party died of scurvy by winter's end. Other French settlements and seigneuries were founded along the Saint John River and the North Shore through the 17th century, including Fort La Tour (present-day Saint John) and St. Peter, founded by Nicolas Denys at the site of present-day Bathurst. 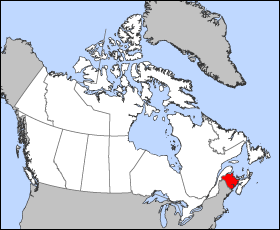 New Brunswick became part of the French territory of Acadia. The French maintained good terms with the First Nations. The first British claim to New Brunswick was in 1621, when Sir William Alexander was granted, by King James I, all of present-day Nova Scotia, New Brunswick and part of Maine. The entire tract was to be called Nova Scotia, Latin for "New Scotland". With the help of Charles de la Tour, the founder of the fort of the same name described above, the British managed to take control of the area. Most French settlers, however, refused to give an oath of allegiance to the British crown. Even worse for the British, the Micmac and Maliseet peoples made no bones about their support for the Acadians. They collaborated to attack and rebel the British on many occasions. In 1755, Colonel Winslow, on orders, descended on numerous Acadian settlements and dispossessed them of their land and all their belongings, and forced all of them onto ships. This became known as the Expulsion of the Acadians. Many people, often separated from their families, moved to northern or western New Brunswick. Others moved to Louisiana (still a French territory at the time), where they became Cajuns. Even then, the British continued their aggression. They captured and destroyed Fort Beausejour (near Sackville) in 1755, and St. Anne (across from present-day Fredericton) in 1759. France relinquished all claims to title in North America after they lost at the Plains of Abraham in Quebec in 1759. Most what is now New Brunswick was then Sunbury County in the colony of Nova Scotia. Its relatively inland location meant there was less settlement there than in the rest of the colony, until the American Revolution. Britain convinced Loyalists from New England to settle in the area by giving them free land. (It should be noted that most of the existing settlers actually favoured the American rebels.) There was little local political organization, and obviously what organization there was came from distant Halifax. Nova Scotia was required to be split, and the Province of New Brunswick was officially created by Sir Thomas Carleton on August 16, 1784. New Brunswick was named in honour of the British monarch, King George III, who was descended from the House of Brunswick. Fredericton, the capital city, was likewise named for George III's second son, Prince Frederick Augustus, Duke of York. Fredericton was chosen as the capital, shocking residents of the larger Parrtown (later renamed Saint John) The reason given was because Fredericton's inland location meant it was less prone to enemy (i.e. American) attack. 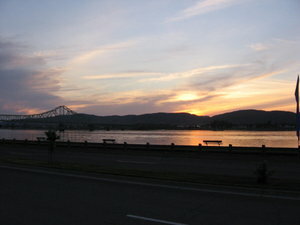 Saint John did, however, became Canada's first incorporated city. It also found itself as home to American traitor Benedict Arnold, whose shady local business dealings gave him no less hatred among his fellow Loyalists. The War of 1812 had little effect on New Brunswick. Forts such as the Carleton Martello Tower in Saint John and the St. Andrews Blockhouse were constructed, but no action was seen. Locally, New Brunswickers were on good terms with those in Maine and the rest of New England, and there was even one incidence where the town of St. Stephen lent all its share of gunpowder to Calais, Maine, across the river, for Fourth of July celebrations. Further north along the Maine-New Brunswick border, the boundary was disputed. Officials in London and Washington, D.C. stated their claims, but some local residents did not care one way or the other, even after pushed by British magistrates. When a resident of Edmundston was asked which side he supported, he replied "the Republic of Madawaska". The name is still used today to describe the northwestern corner of the province. The boundary dispute, known as the Aroostook War, was settled in 1842. More settlers came in 1845 from Ireland after the Potato Famine broke out. Many of these people settled in Saint John or Chatham, which to this day calls itself the Irish Capital of Canada. The Catholic population often clashed with the existing Protestant residents, coming to a head with a gun battle in Saint John in 1849. Throughout the 19th century, shipbuilding, both on the Bay of Fundy shore and the Miramichi, was the dominant industry in New Brunswick, although resource-based industries such as logging and farming were also important. In the latter part of the century, several railways were built across the province, making it easier for these inland resources to make it to markets elsewhere. New Brunswick was one of the four original provinces of Canada formed with Confederation in 1867. The Charlottetown conference of 1864 was initially intended only to discuss a union of New Brunswick, Nova Scotia and Prince Edward Island, but interest developed in the Province of Canada (formerly Upper and Lower Canada, later Ontario and Quebec). Many residents of the Maritimes wanted no part of Confederation for fear that the region's needs would be overshadowed by those of the rest of the country, and many politicians involved - such as Sir Leonard Tilley, New Brunswick's best-known Father of Confederation - found themselves without a seat after the next election. Following Confederation, New Brunswick suffered the effects of an economic downturn precipitated by the Great Fire of 1877 in Saint John and the decline of the sailing shipbuilding industry, and compounded by the global recession sparked by the Panic of 1893. Many skilled workers moved west to other parts of Canada or south to the United States, but as the 20th century dawned, the province's economy expanded again. Manufacturing gained strength with the construction of several cotton mills across the province and, in the crucial forestry sector, the sawmills that had dotted inland sections of the province gave way to larger pulp and paper mills. Nevertheless, unemployment remained relatively high and the Great Depression provided another setback. Two influential families, the Irvings and the McCains, emerged from the depression to begin to modernize and vertically integrate the provincial economy. The Acadians, who had mostly fended for themselves on the northern and eastern shores, were traditionally isolated from the English speakers that dominated the rest of the province. Government services were often not available in French, and the infrastructure in predominantly French areas was noticeably less evolved than in the rest of the province. This changed with the election of premier Louis Robichaud in 1960. He embarked on the ambitious Equal Opportunity plan in which education, rural road maintenance, and health care fell under the sole jurisdiction of a provincial government that insisted on equal coverage of all areas of the province. County councils were abolished with rural areas outside cities, towns and villages coming under direct provincial jurisdiction. The 1969 Official Languages Act made French an official language, on par with English. Linguistic tensions rose on both sides, with the militant Parti Acadien enjoying brief popularity in the 1970s and anglophone groups pushing to repeal language reforms in the 1980s, but tensions had all but disappeared by the 1990s. New Brunswick has a complete network of English and French public schools serving from kindergarten to high school; there are also several private secondary schools having secular and religious affiliations. The New Brunswick Community College system is province-wide with campuses in most major centres; the community college has both French and English campuses. There are also specialized training colleges not part of the NBCC system. As with the rest of the Maritimes, New Brunswick's universities were started by various Christian denominations, although most are now public and any remaining affiliation with founding churches is largely symbolic. The University of New Brunswick was founded as King's College in Fredericton in 1785 with Anglican affiliation. Today a medium-sized public English comprehensive university with its principal campus in Fredericton and a satellite campus in Saint John, it is the oldest public post-secondary education institution in North America. St. Thomas University was founded in Chatham in 1910 with Catholic affiliation. Today a small public English undergraduate university located in Fredericton, the university's liberal arts program is complemented by professional programs in education and social work. Mount Allison University was founded in Sackville in 1839 with Methodist affiliation. Today a small public English undergraduate university still located in Sackville, it has consistently topped the Maclean's magazine survey of Canadian universities in the undergraduate university category since the survey was begun. Mount Allison produces a Rhodes Scholar about once every two years on the average, and was the first university in the British Empire to grant a Bachelor's degree to a woman. The Université de Moncton system was founded in 1963 and is comprised from founding Catholic colleges which were located in Memramcook, Bathurst and Edmundston. Today a medium-sized public French comprehensive university with its principal campus in Moncton and satellite campuses in Edmundston and Shippagan. Atlantic Baptist University and St. Stephen's University are small private Christian undergraduate universities offering Bachelor's degrees. Both were started in the mid-twentieth century as bible training schools and grew to become accredited Liberal Arts universities. They do not receive any public funding. ABU is located in Moncton and remains directly controlled by the Atlantic Baptist Convention, whereas St. Stephen's is located in St. Stephen and is ecumenical but directly controlled by its founding denominations. The Acadians are survivors of the Great Expulsion (1755) which drove several thousand French residents into exile in North America, the U.K. and France for refusing to take an oath of allegiance to George II of Great Britain during the French and Indian War. American Acadians, who wound up in Louisiana and other parts of the American South, are often referred to as Cajuns. Many of the English-Canadian population of New Brunswick are descended from United Empire Loyalists who fled the American Revolution. This is commemorated in the province's motto, Spem reduxit (hope was restored). There is also a significant population of Irish ancestry, especially in Saint John and the Miramichi Valley. People of Scottish descent are scattered throughout the Province with especial concentrations in the Miramichi and in Campbellton. A small number of Danish origins may be found in New Denmark. First Nations in New Brunswick include the Mi'kmaq and Maliseet. The Catholic Church is the largest denomination because of the large French and Irish populations. The three largest Protestant denominations in New Brunswick are: United Church of Canada and the Baptist and Anglican churches. The provincial flower is the purple violet. The provincial bird is the black-capped chickadee, in common with the American state of Maine. Land Features - Mount Carlton - Highest point (2,680 ft.); Appalachian Mountains.